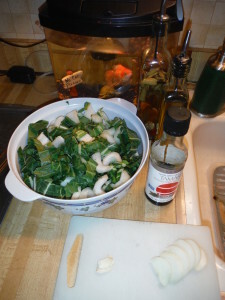 To start, gather your ingredients: bok choy, onion, garlic, tamari (or coconut aminos), white vinegar, olive oil, and black pepper. Add olive oil to a medium pot over medium-high heat. Saute onions and garlic until soft. 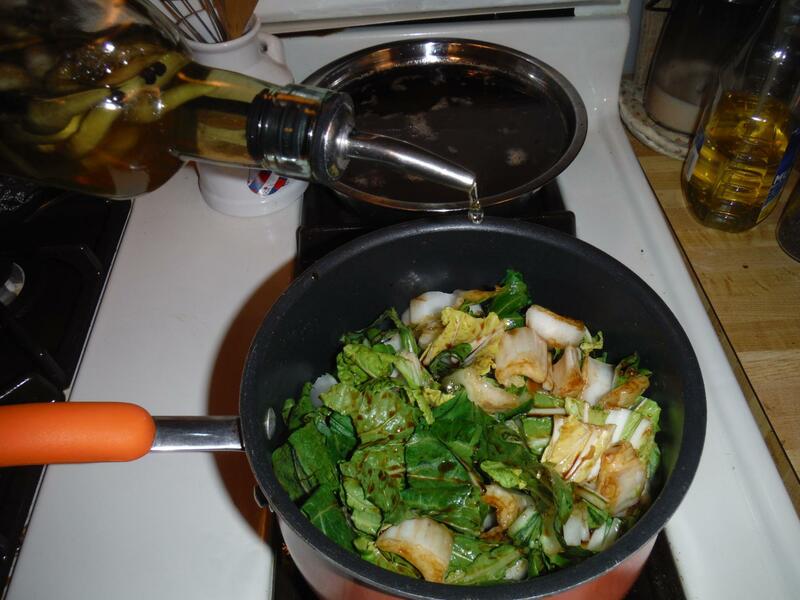 The goal is to flavor the oil before we put in the bok choy. The heat will extract the aroma and flavors as it softens. Add the chopped bok choy. Pour in tamari or coconut aminos. Add white vinegar and black pepper. You’ll notice my white vinegar is less white and more spicy! This adds amazing flavor to the vinegar and works well as a condiment or marinade. It’s a mixture of hot peppers, garlic cloves, onions, peppercorns, and white vinegar. Put in a glass container and set aside for about a week. The longer it sits, the spicier it becomes! Back to the bok choy – sauté with the liquids for about 15 minutes. The bok choy will wilt and reduce. If you’d like the adobo to have more of a sauce, add some water and simmer over low until the water has reduced out. Serve with your protein of choice or just eat alone like a hot salad. It’s so delicious! Add olive oil to a medium pot over medium-high heat. 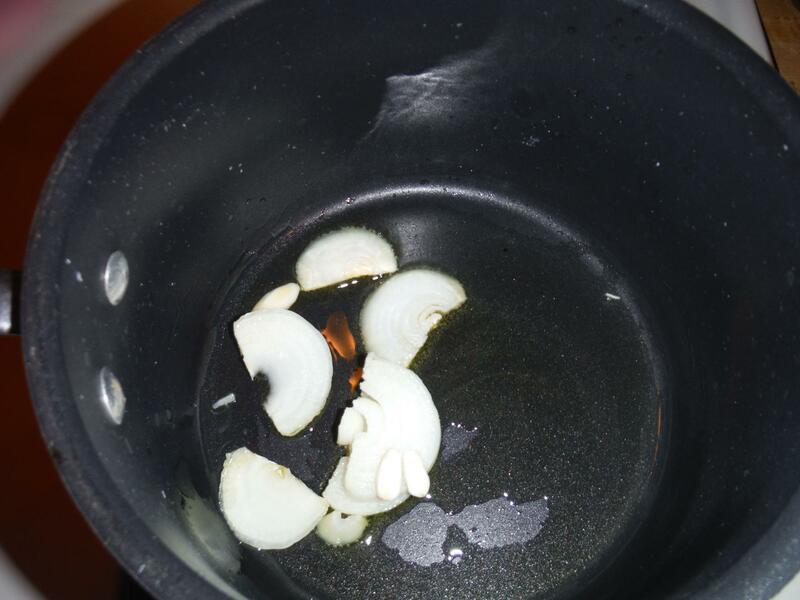 Saute onion and garlic over medium-high heat until soft, about 5-7 minutes. Add chopped bok choy, tamari, vinegar, hot peppers (optional), and pepper. 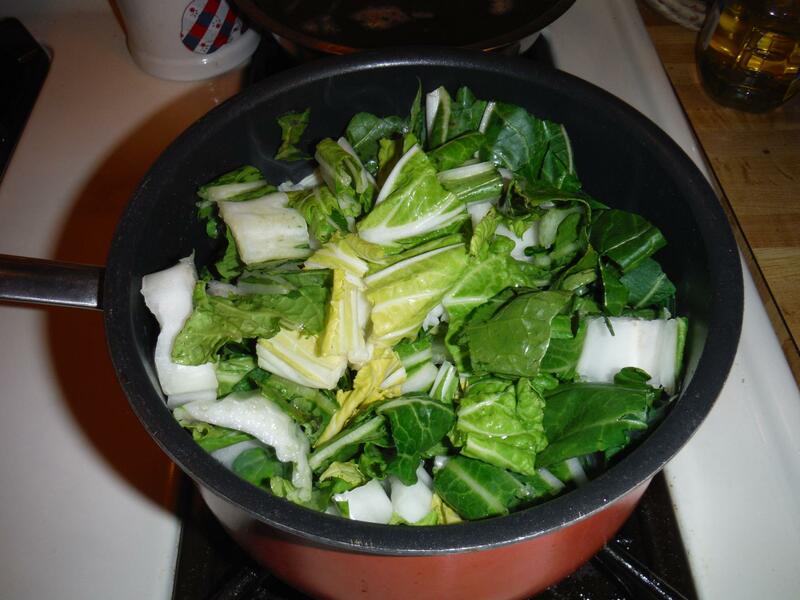 Lower heat to medium-low and simmer until bok choy is wilted and sauce had reduced, about 10-15 minutes. 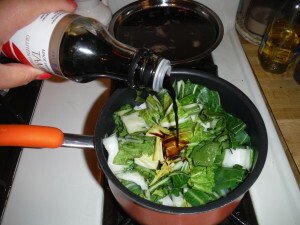 For a soupier sauce, add water and simmer over low until liquid had reduced to desired amount.